Never mind how it got that name. Never mind that it’s not much to look at on a hanger. Never mind even that Steve McQueen wore one. Once a Harrington jacket is on, it almost always wins a new fan – for its carefully considered detailing, its simplicity, versatility and, let’s face it, for its super cool. That will explain why the Harrington became a staple of not one but four seminal style cultures, and why the latest versions still look as fresh as the first one did more than 80 years ago. Just as easy to wear now as it was then, the Harrington is lightweight, adaptable and suits a range of body types and personal styles – plus, it may just be the ultimate transeasonal piece of outerwear, one of the few cool jackets you can wear year round. Quiz time: what has 1950s Americana and 1970s British inner city life got in common? The Harrington jacket. It was the kind of thing being worn – in bright red – by James Dean in Rebel Without a Cause: a generous, cropped, raglan-sleeved blouson, with a couple of slanted slit or flap pockets, knitted cuffs and (sometimes) hem, fabric side-adjusters, zip fastening and a double-button, funnel-neck tab collar. But it was also the very same style of jacket that was favoured by the original skinheads – back before Neo-Nazis co-opted what was an iconic Ska-loving style tribe. Dean wore his collar turned up and zipped just at the waist – it’s all attitude; the skinheads sometimes wore theirs inside out, showing off the traditional tartan checked lining. But they both appreciated the simplicity of a garment still replete with useful detailing: lightweight, showerproof – like a trench coat it had a back yoke that allowed water to run away from the jacket – comfortable, and able to be dressed up or down. Small wonder then that the mods also dabbled, as well as the northern soul crowd. And the casuals. Indeed, this perhaps suggests that the Harrington’s origins are British, despite coming to be nicknamed after an American: Rodney Harrington, a character played by Ryan O’Neal in 1960s TV drama Peyton Place, who also favoured the style. Before then – and to aficionados now – what became a generic style was known as the G9, the model code British garment manufacturers John and Isaac Miller gave to the jacket when they first launched it under the Baracuta brand in 1937. It was quickly appreciated too, initially most enthusiastically in the US – hence its nickname hailing from there. 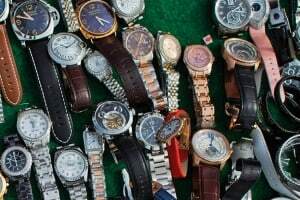 The style was first exported in 1950 to America, where imitators quickly produced more local versions. Elvis Presley wore a Harrington jacket in King Creole (1958) and on the cover of 1968’s ‘A Little Less Conversation’ sleeve; Frank Sinatra wore one in Assault on a Queen (1966) and many other movies. 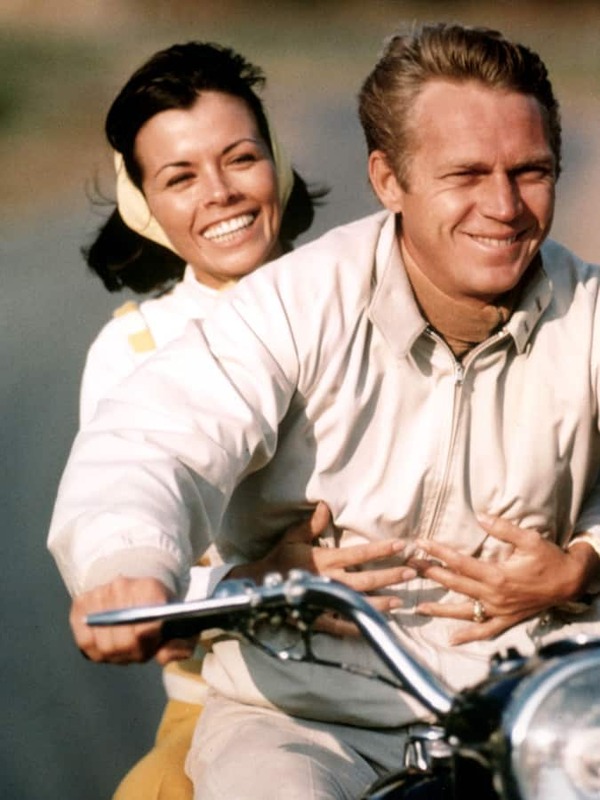 But arguably it was Steve McQueen who put the Harrington on the global stage. In 1963 McQueen appeared on the cover of Life, then one of the world’s biggest magazines. He was riding a motorbike. He was wearing a Harrington. He looked very cool. Unsurprisingly, later Baracuta would issue special editions of the jackets worn by the three men who helped make their jacket a wardrobe staple. Perhaps the definitive version of the Harrington is the style worn by The Clash for their Times Square concerts in 1981, with its Fraser clan lining in green, black and red. That may be getting on for 40 years ago but, all the same, the way Joe Strummer makes it his own – sleeves pulled up, worn over an undone shirt and neckerchief, with jeans and braces – speaks to the blank canvas quality of the style, especially when compared with the Americans’ essentially preppy approach. Small wonder, given the Harrington’s more everyman quality then, that Spencer is not alone in his appreciation. 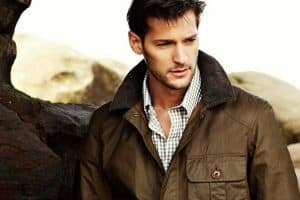 Just about every designer brand – whether edgy or luxury, from Dunhill to Dries van Noten, Ferragamo to Belstaff – has produced its own version of the jacket at one time or another. It’s a classic. It may not have been the original idea, but it’s come to pass that the archetypal Harrington look is preppy all the way. Team yours with an Oxford button-down or polo shirt, khakis and penny loafers. The Harrington is one of those garments that – while the classics come in block colours – looks as good in a bold pattern. Try it in checks, geometrics, even florals and camouflage. Just remember to anchor with neutral basics in order to let it take centre stage. It’s not a jacket that works over a suit, or with elegant dress shoes, but it looks perfectly at home over a business casual combo of shirt and tie, with smart trousers. If the nature of your work allows it, more sober shades are a safer choice. Don’t think of the Harrington as being essentially just a spring or autumn garment. It’s an ideal transeasonal piece, especially since its looser fit still allows for a sweater underneath. Team with a Guernsey or lambswool crew-neck. You could even pull off wearing a Harrington under a longer, heavier coat in the same way you might a denim jacket. Since the Harrington is simple – and works with just about anything – equally simple casual attire looks great with it, and is the best way to make the jacket the star of the show. Wear it with a pair of selvedge jeans and a plain white T-shirt for no-brainer style points. Do, if you’re feeling more classical, stick to the archetypal colours for the harrington: navy or beige. Avoid black if possible, if only because – for reasons unknown – cheap knock-off Harringtons always seem to come in black. Do get the right size Harrington for your frame: it’s a looser fit style of jacket than fashion’s obsession with slim fit would typically favour, so expect it to feel roomier than usual. But don’t go oversized: it should sit on your belt, and sleeves should be the correct length. Do pick the right fabric for your needs – the high density weave cotton is a good all-rounder, and keeps the look timeless, but there are plenty of other options in wools, corduroys and blends, as well as lined in more technical fabrics such as moisture-wicking Coolmax. 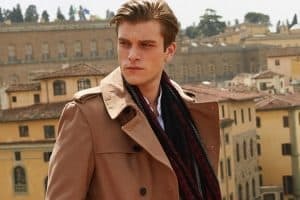 Don’t wear the collar up all the time, unless it’s raining all the time: the stiffness of the classic Harrington fabric may make for a stand-up style, but there’s the risk of looking too self-consciously Mr. Cool. Besides, turning it down allows for a flash of tartan lining. Don’t wear a Harrington with circulation-bothering skinny jeans or trousers. The proportions of the Harrington require balance in the lower half of your outfit too, so more regular fit trousers work better. A Harrington is at its best in a simple, timeless colour – i.e. stone or navy. This way, it allows the jacket’s many design details to shine and it also means that the contrast with the check lining is at its most pronounced, giving an effective pop of colour when worn open. This was how the jacket was supposed to look. Extra marks for authenticity, so opt for a brand like Baracuta, Fred Perry or Ben Sherman. Luxurious takes on the Harrington have been rife in recent seasons, with many lightweight lambskin and robust suede pieces being popular choices, and with good reason. When constructed from leather, the Harrington is elevated from humble mid-century classic to standout wardrobe hero in no time at all. Opt for a suede jacket in dark brown or olive and you’ll find yourself with a surprisingly versatile jacket you’ll want to wear year-round, but probably won’t be able to. Thanks to Rebel Without a Cause, it’s entirely possible to look good in a statement colour Harrington. There are numerous hues to choose from today, but why not make like Jim Stark and opt for one in cherry red? Although not for the fainthearted, it can easily be toned down by wearing it with dark denim jeans, loafers or minimal trainers and a plain white T-shirt. Ideally combine it with a 1950s hot-rod if you can – if not, just stick to weekend wear and avoid wearing to the office. Although traditionally the check pattern resides on the inside of a Harrington – a Fraser tartan, to be precise – the style lends itself well to bolder patterns on the outside. Think houndstooths and micro checks – patterns that offer a bit of texture and a point of difference, but aren’t so bold as to blind anyone that looks in your general direction. Pair with muted garments to keep the look wearable – navy chinos and brown leather Derby shoes are a good bet. Given that it was designed as a cropped raincoat first and foremost – its water-deflecting rear yoke attests to this – it makes sense that some of the most effective Harringtons are cut from lightweight, technical weatherproof cloths. Ideal for spring showers and for doubling up with knitwear in autumn, a shower-resistant Harrington in navy is an obvious choice for tackling unpredictable climes – look for treated cotton/nylon-blends, which’ll reject any unwanted rainy advances with ease.